GASB Statement No. 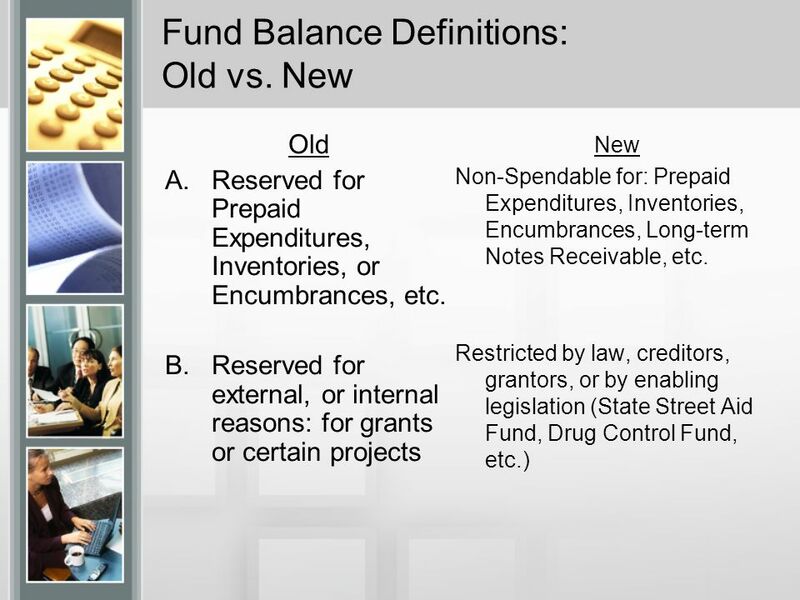 54 Fund Balance Reporting and Governmental Fund Type Definitions (Effective for FYE June 30, 2011) John F. Sutton, CPA Audit Manager. 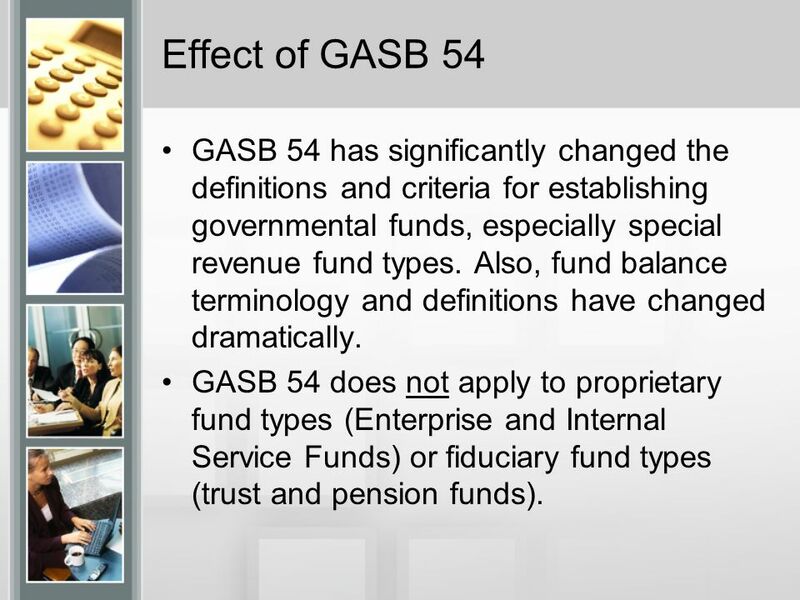 3 Effect of GASB 54 GASB 54 has significantly changed the definitions and criteria for establishing governmental funds, especially special revenue fund types. 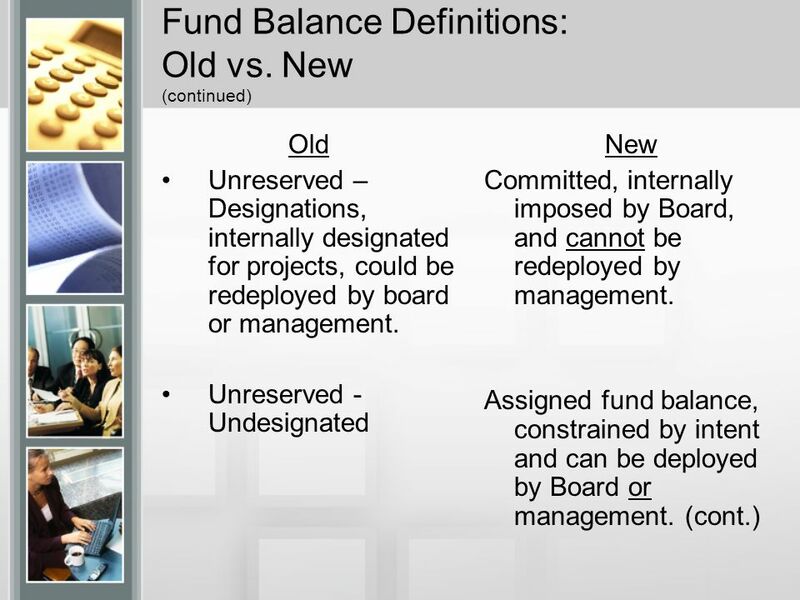 Also, fund balance terminology and definitions have changed dramatically. 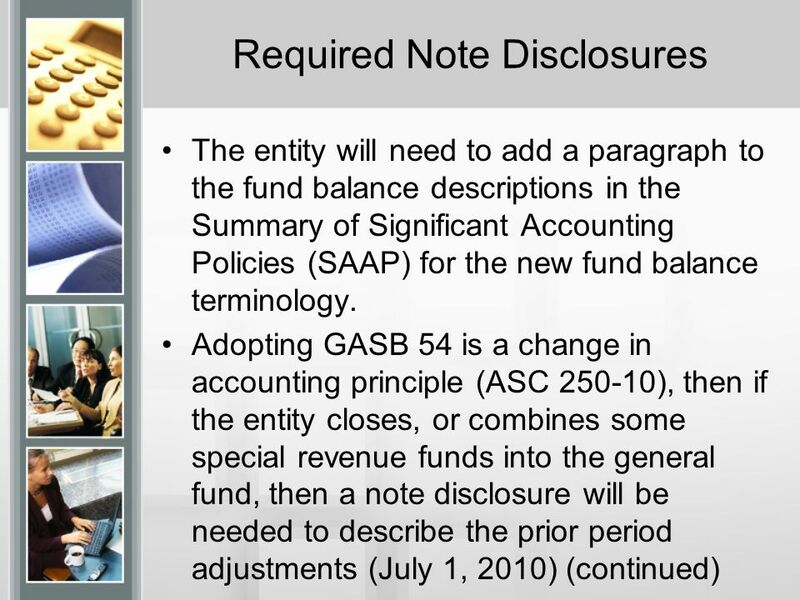 GASB 54 does not apply to proprietary fund types (Enterprise and Internal Service Funds) or fiduciary fund types (trust and pension funds). 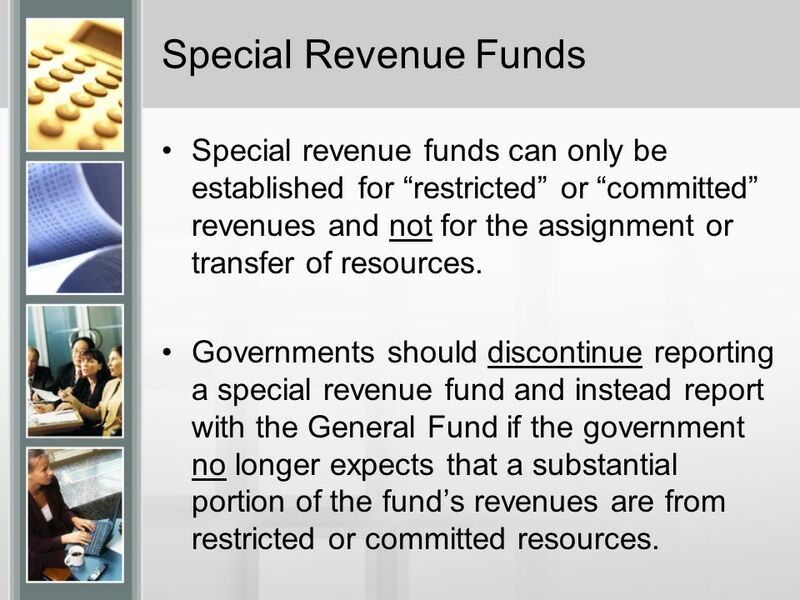 5 Special Revenue Funds Special revenue funds can only be established for restricted or committed revenues and not for the assignment or transfer of resources. Governments should discontinue reporting a special revenue fund and instead report with the General Fund if the government no longer expects that a substantial portion of the funds revenues are from restricted or committed resources. 6 Restricted vs. Committed Restricted – Restraints imposed by creditors, grantors, contributors, or laws and regulations. These are also considered a legal restriction or external legal limitation (legally enforceable requirements). 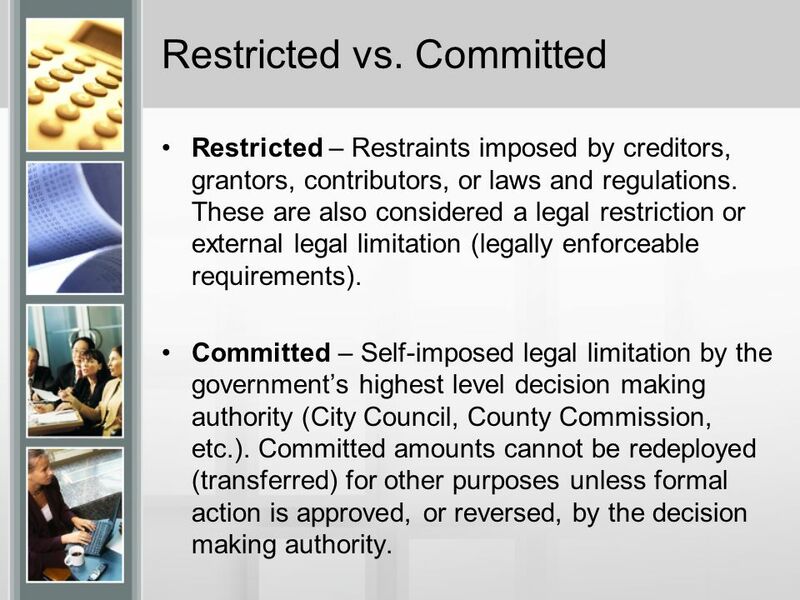 Committed – Self-imposed legal limitation by the governments highest level decision making authority (City Council, County Commission, etc.). Committed amounts cannot be redeployed (transferred) for other purposes unless formal action is approved, or reversed, by the decision making authority. 7 Special Revenues No special revenues can be used unless they meet the restricted or committed requirements. 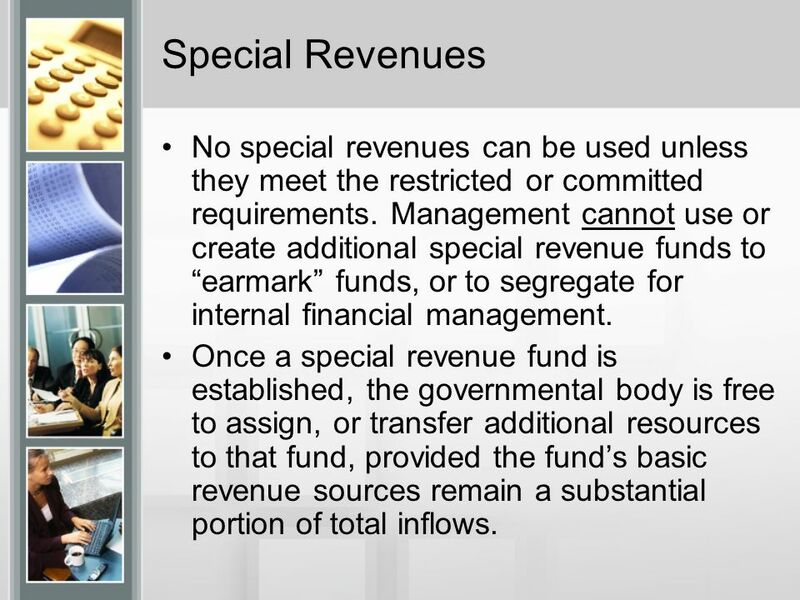 Management cannot use or create additional special revenue funds to earmark funds, or to segregate for internal financial management. Once a special revenue fund is established, the governmental body is free to assign, or transfer additional resources to that fund, provided the funds basic revenue sources remain a substantial portion of total inflows. 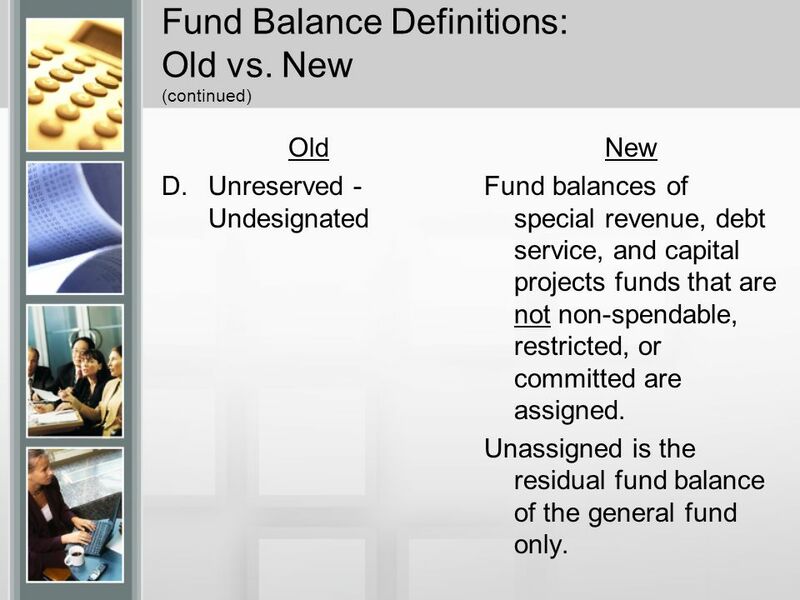 11 Fund Balance Definitions: Old vs. New (continued) Old D.Unreserved - Undesignated New Fund balances of special revenue, debt service, and capital projects funds that are not non-spendable, restricted, or committed are assigned. Unassigned is the residual fund balance of the general fund only. 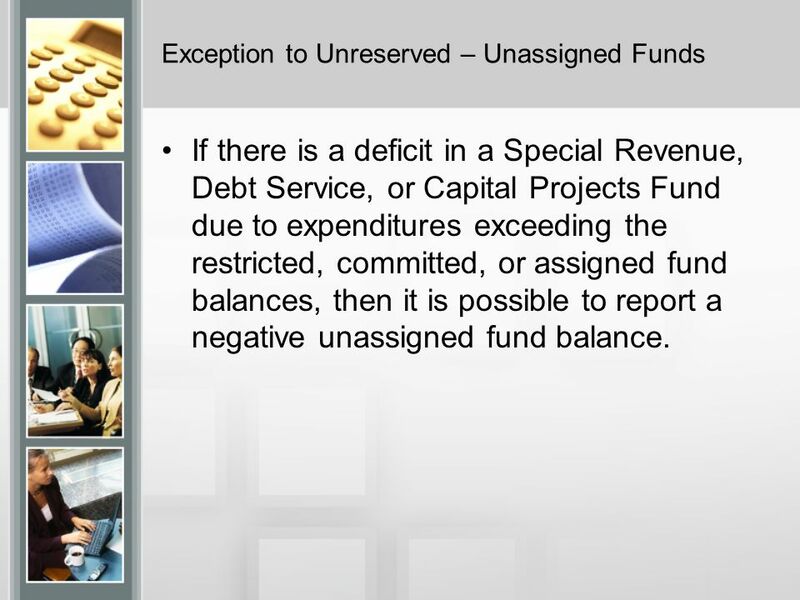 12 Exception to Unreserved – Unassigned Funds If there is a deficit in a Special Revenue, Debt Service, or Capital Projects Fund due to expenditures exceeding the restricted, committed, or assigned fund balances, then it is possible to report a negative unassigned fund balance. 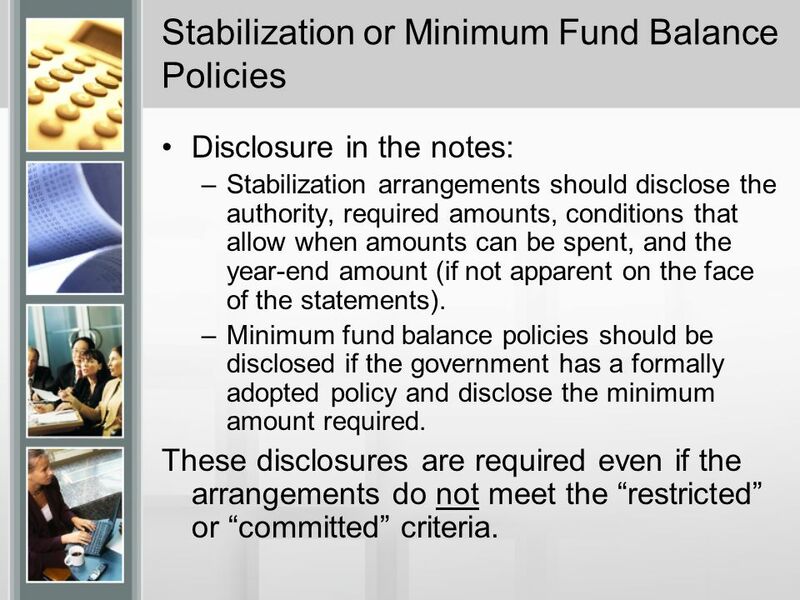 13 Stabilization or Minimum Fund Balance Policies Disclosure in the notes: –Stabilization arrangements should disclose the authority, required amounts, conditions that allow when amounts can be spent, and the year-end amount (if not apparent on the face of the statements). –Minimum fund balance policies should be disclosed if the government has a formally adopted policy and disclose the minimum amount required. These disclosures are required even if the arrangements do not meet the restricted or committed criteria. 15 Required Note Disclosures (Cont.) (cont.) to the general fund balance and special revenue fund balances for funds that were closed, or combined. 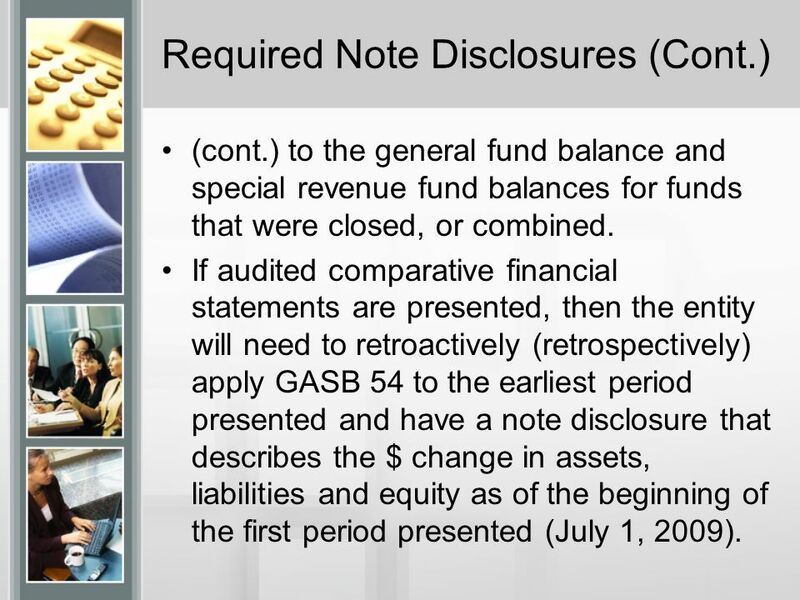 If audited comparative financial statements are presented, then the entity will need to retroactively (retrospectively) apply GASB 54 to the earliest period presented and have a note disclosure that describes the $ change in assets, liabilities and equity as of the beginning of the first period presented (July 1, 2009). 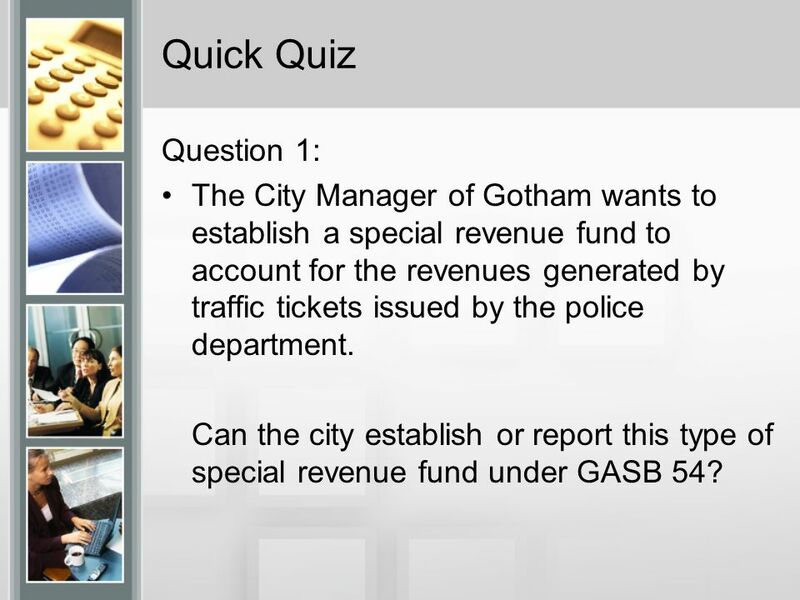 16 Quick Quiz Question 1: The City Manager of Gotham wants to establish a special revenue fund to account for the revenues generated by traffic tickets issued by the police department. Can the city establish or report this type of special revenue fund under GASB 54? 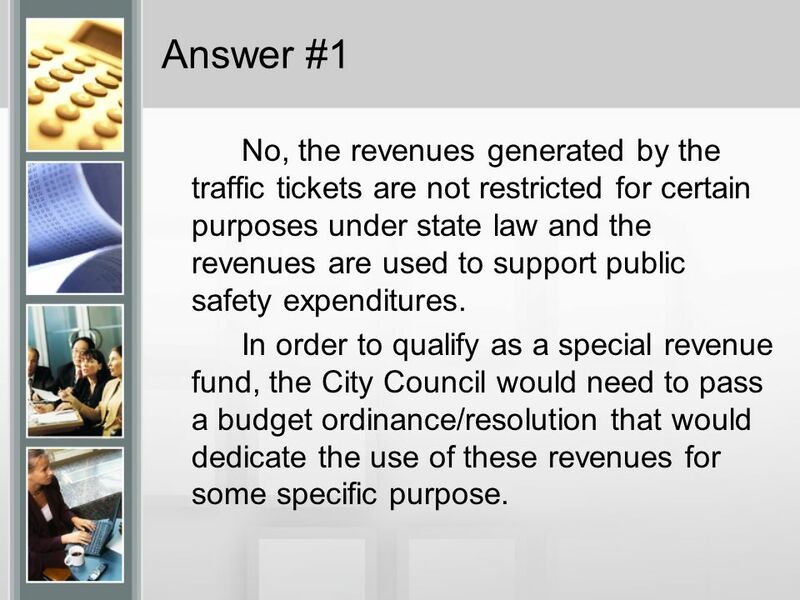 17 Answer #1 No, the revenues generated by the traffic tickets are not restricted for certain purposes under state law and the revenues are used to support public safety expenditures. In order to qualify as a special revenue fund, the City Council would need to pass a budget ordinance/resolution that would dedicate the use of these revenues for some specific purpose. 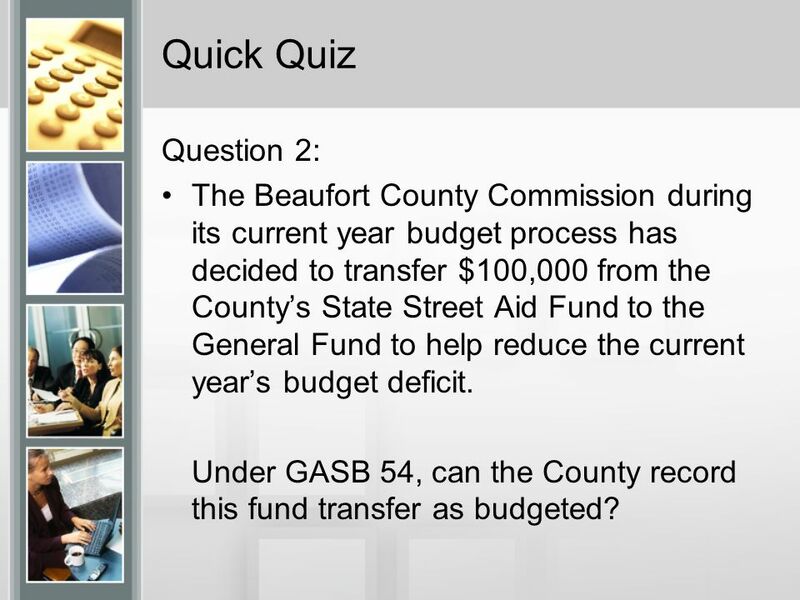 18 Quick Quiz Question 2: The Beaufort County Commission during its current year budget process has decided to transfer $100,000 from the Countys State Street Aid Fund to the General Fund to help reduce the current years budget deficit. Under GASB 54, can the County record this fund transfer as budgeted? 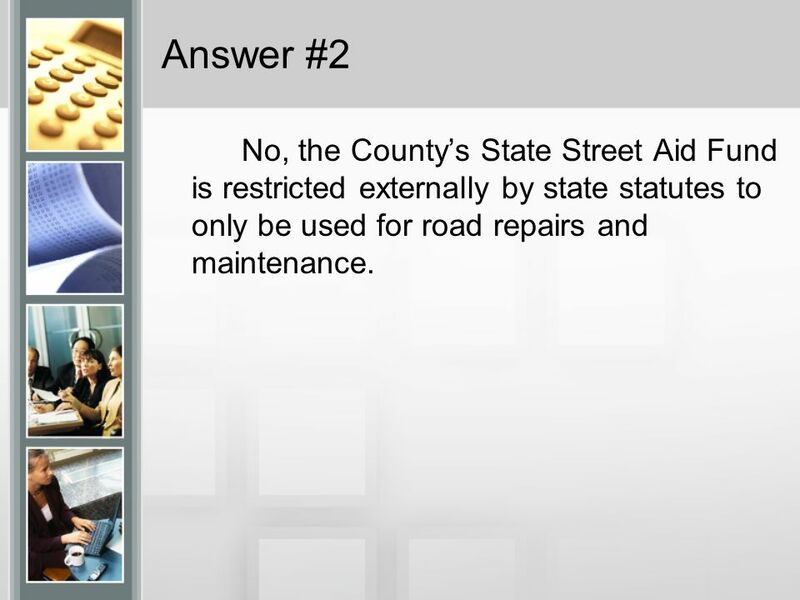 19 Answer #2 No, the Countys State Street Aid Fund is restricted externally by state statutes to only be used for road repairs and maintenance. 20 Quick Quiz Question # 3: The B.O.E. finance director decides to make a transfer of $100,000 from the General Funds assigned fund balance for technology to unassigned fund balance to help pay for unexpected increased costs in utilities and fuel. 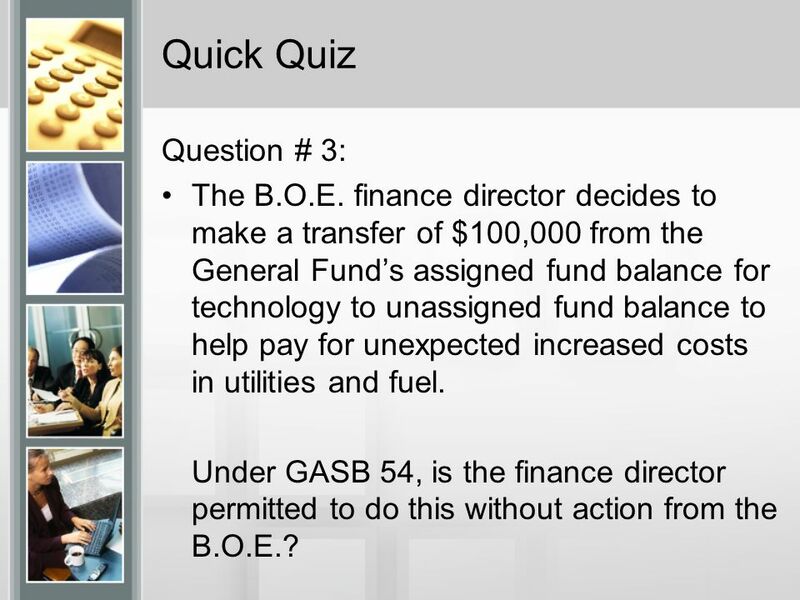 Under GASB 54, is the finance director permitted to do this without action from the B.O.E.? 21 Answer #3 Yes, management is allowed to make transfers from an assigned fund balance which is used for intent and can be redeployed by the Board or management. 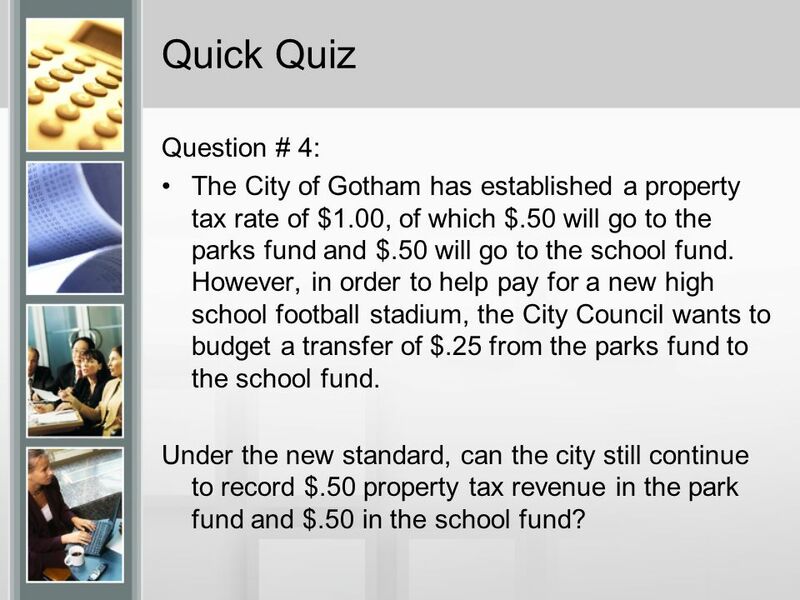 22 Quick Quiz Question # 4: The City of Gotham has established a property tax rate of $1.00, of which $.50 will go to the parks fund and $.50 will go to the school fund. However, in order to help pay for a new high school football stadium, the City Council wants to budget a transfer of $.25 from the parks fund to the school fund. Under the new standard, can the city still continue to record $.50 property tax revenue in the park fund and $.50 in the school fund? 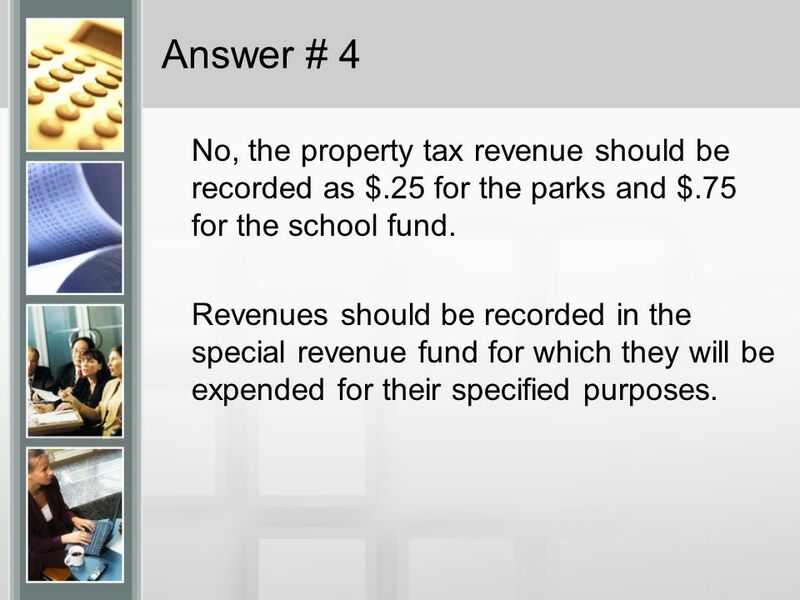 23 Answer # 4 No, the property tax revenue should be recorded as $.25 for the parks and $.75 for the school fund. Revenues should be recorded in the special revenue fund for which they will be expended for their specified purposes. 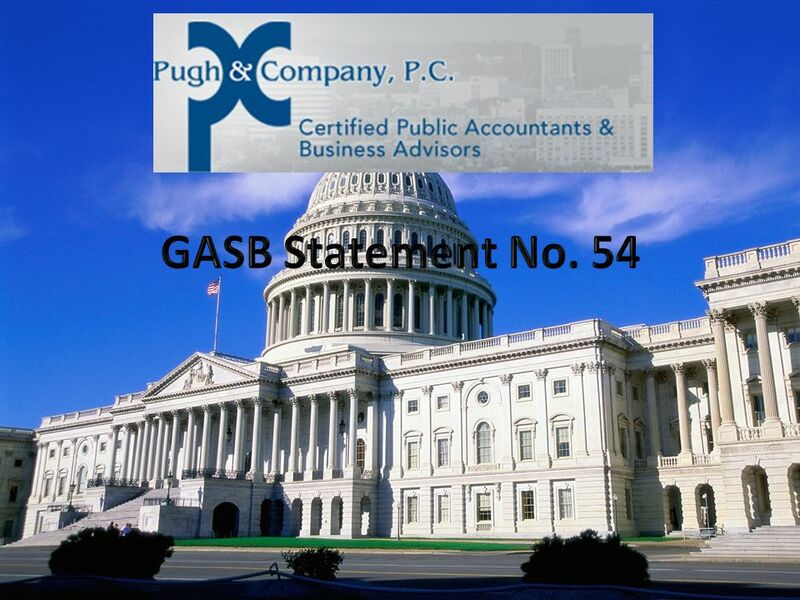 Download ppt "GASB Statement No. 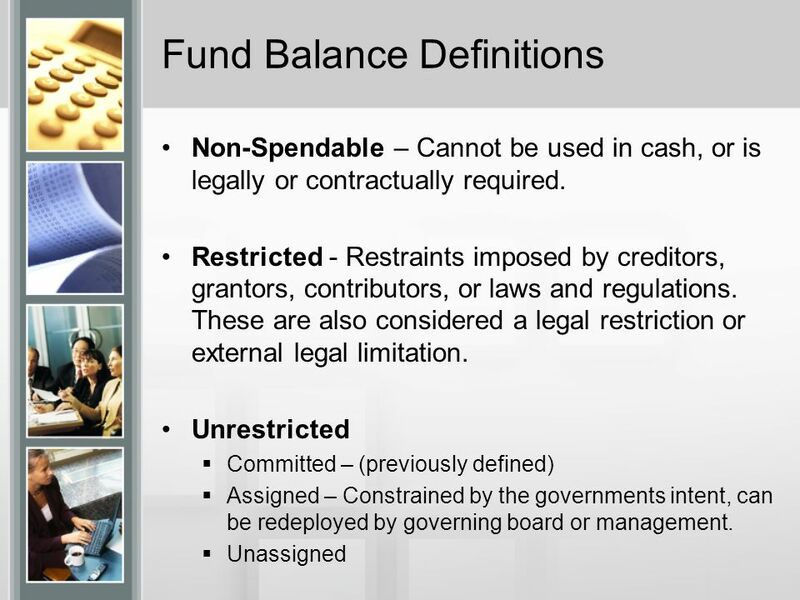 54 Fund Balance Reporting and Governmental Fund Type Definitions (Effective for FYE June 30, 2011) John F. Sutton, CPA Audit Manager." Essentials of Accounting for Governmental and Not-for-Profit Organizations Chapter 9 Accounting for Special Purpose Entities, Including Public Colleges. Dean Michael Mead Research Manager, Governmental Accounting Standards Board NASACT-AGA Audio Conference April 29, 2009 GASB Statement No. 54, Fund Balance. Capital Reserves and EDA Grants Department of Education Division of Finance November 28, 2001. 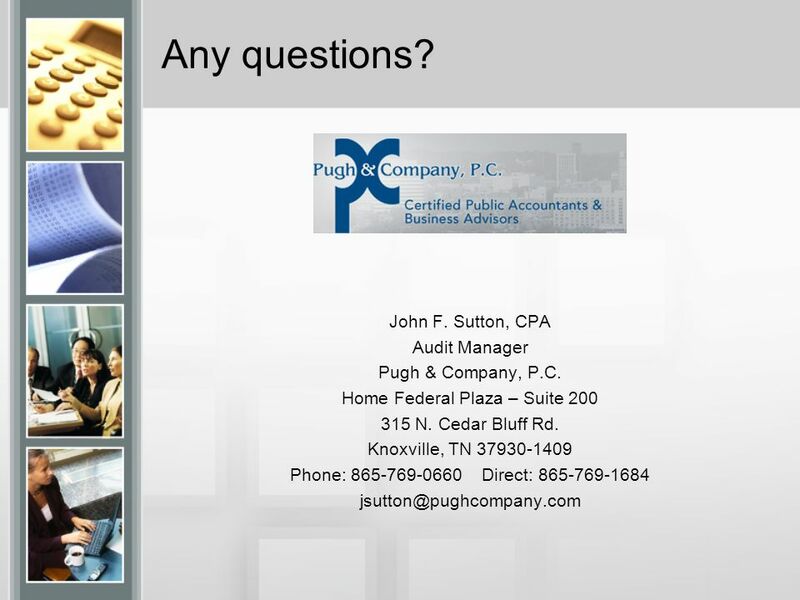 GASB Update Chris Deweese, CPA, Member Suttle & Stalnaker, PLLC. SWARTZ CREEK COMMUNITY SCHOOLS Financial Statement Presentation. Chapter Seventeen Accounting for State and Local Governments (Part II) Copyright © 2015 McGraw-Hill Education. All rights reserved. No reproduction or. Review of Audited Financial Statements as of and for the Year Ended June 30, 2013. VICKI VANDENBERG, CPA PARTNER KEITH MARTINEZ, CPA ASSOCIATE PLANTE MORAN DECEMBER 13, 2011 Net Asset Classification – Why Is It Important? Chapter Sixteen Accounting for State and Local Governments (Part I) Copyright © 2015 McGraw-Hill Education. All rights reserved. No reproduction or distribution. 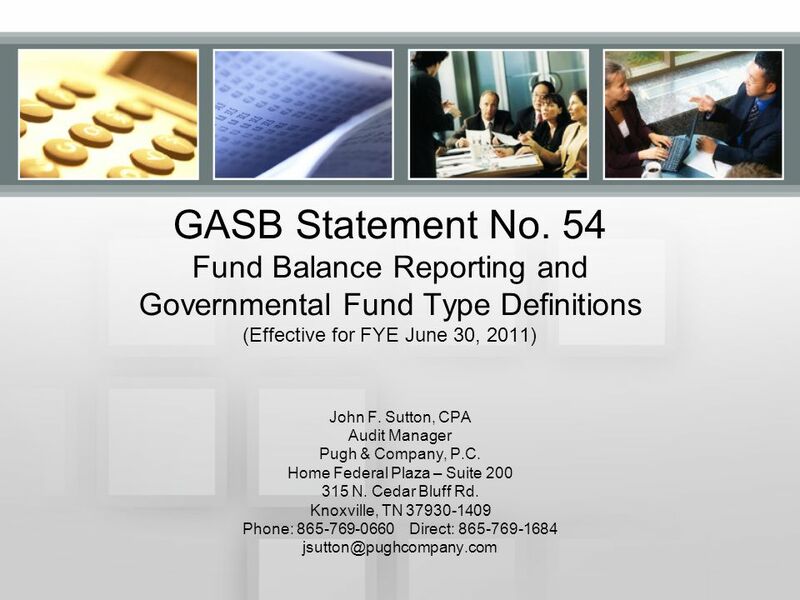 GASB 54 Implementation Fund Balance Reporting and Governmental Fund Type Definitions June 14, 2011. Marcia Taylor, CPA, CGFM William McKain, CPA Pennsylvania Association of School Business Officials March 17, 2011. CSMFO 2012 Annual Conference Implementing GASB 54 (Fund Balance Reporting) Presentation by Gregory S. Allison, CPA UNC School of Government. PRESENTED BY: BERT SMITH & CO. GOVERNMENT FINANCE OFFICERS ASSOCIATION OF THE WASHINGTON METROPOLITAN AREA GASB UPDATE 2009 November 20, 2009. Element One:  Transparency Requirements ◦ Current law Element Two:  Reserve Caps ◦ Implemented only if Proposition 2 is approved by voters November. 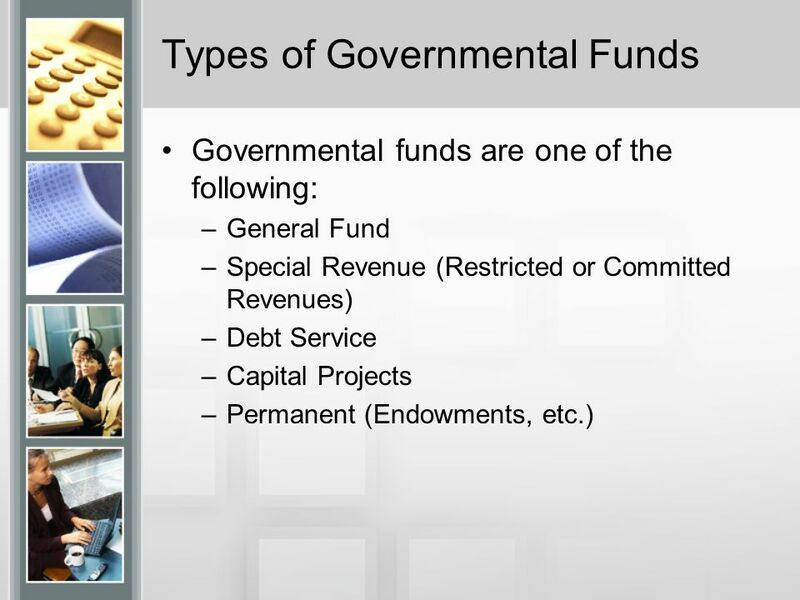 Fund Accounting -- Government Entities Hartwell C. Herring III University of Tennessee. MIKUNDA, COTTRELL & CO. Certified Public Accountants and Consultants 3601 “C” Street, Suite 600 Anchorage, Alaska 99503 (907) 278-8878 GASB Update.